After 18 months of intense player feedback, a few dented walls and several hundred buckets of sweat, Independent Game developer One Hamsa today moved its hi-octane VR arcade sports game Racket: Nx out of Early Access. Best described as playing racquetball (squash to some) inside a giant pinball machine, the title has garnered an impressive ‘very positive’ score from 98% of players. 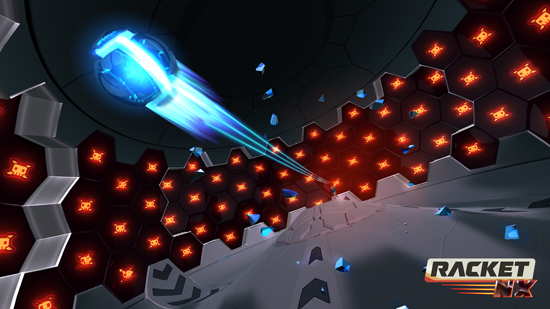 Racket: Nx has been developed in conjunction with audio giant Waves, whose Nx Spatial Audio Technology creates incredible new levels of 360-degree sensory immersion so that players can turn the sound to their advantage. Gamers begin by entering a 360-degree domed arena surrounded by a variety of different panels. Once play begins, the players must rack up their high score by targeting score panels with extreme precision before the timer runs out. Players also need to maintain their health bar by avoiding penalty-dealing death panels as well as restoring health by hitting health panels. A grappling hook tool maintains Racket: Nx’s frenetic pace by enabling players to instantly retrieve the ball for another quick serve. Sound plays a core part in the Racket: Nx experience, with the title taking part of its name from the integrated Waves Nx Spatial Audio Technology that captures the audio in 6 channels. Gamers experience true high-end, 360-degree spatial surround sound that enables them to track the ball even when it’s not within their field of vision. No other video game uses this level of immersive audio technology. Racket: Nx offers up a variety of single-player and multiplayer game modes. Single-player Solo mode offers score-based challenges across dozens of hand-crafted stages of increasing difficulty. In Arcade mode players compete for global highscores in an infinitely intensifying survival mode. Local and online multiplayer modes feature a competitive multiplayer league with head to head matches, a skill rating system and rankings. Cross-platform support allows players across different HTC Vive, Oculus Rift, and Windows Mixed Reality devices to play against each other online. Be careful not to hit stuff as you play!